JPS Industries produces advanced fibers for use in a wide variety of applications, like aerospace, insulation, electronics, construction, body armor and many other product types. 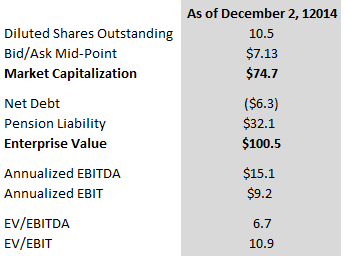 JPS struggled for years with excess leverage and unfocused operations, but now has shed all its debt and slimmed down to a single division. The company’s largest shareholder controls the board and is focused on reducing costs and driving profitability. JPS’ corporate history can be traced all the way back to 1813, when it was founded as J.P. Stevens & Co., a South Carolina textile producer. The company expanded into many different business lines in the 20th century before being taken over by private equity in the leveraged buyout boom of the 1980s. Bankruptcy followed in 1991, and again in 1997. Today’s incarnation of JPS Industries arose from the 1997 bankruptcy restructuring. JPS is now just a small shadow of its former size and significance, with most of its assets long since sold off to other companies. have annual sales in excess of $325 million…” The reality was much less rosy. The financial crisis hit hard and JPS’ 2008 revenue reached only $232.5 million, nearly 30% below target. The new debt, combined with a ballooning pension deficit caused by the stock market crash, wiped out JPS’ profitability for years to come. JPS spent the next several years in recovery mode, using cash flow to reduce debt and selling off its Stevens Roofing division. The company’s recovery process was slowed by a litigation loss of over $10 million in 2011, the result of a long-running dispute over intellectual property. The next few years saw the hedge fund Steel Partners begin to target JPS, ultimately buying up nearly 40% of the company’s shares. At various points, Steel Partners offered to buy the company outright, though it was ultimately rebuffed. In 2013, Steel Partners won a proxy contest and installed four directors on JPS’ board. Steel Partners then installed Mikel H. Williams as CEO. Almost exactly one year to the day after the company leadership change, JPS Industries announced an agreement to sell its Massachusetts-based Stevens Urethane business to Argotec. The price of the sale was not disclosed, but it was sufficient to eliminate all of JPS’ debt . JPS’ net leverage including the pension deficit decreased from $56.8 million on February 1, 2014, to $30.3 million on May 1, suggesting a selling price of around $26.5 million for Stevens Urethane. JPS’ remaining JPS Composites division is having a good year, with revenues for the first three quarters of 2014 up 7.8% from 2013. Adjusted for one-time severance charges related to the CEO change and a litigation recovery, operating income is up 10.9%. Though gross margins were compressed, good cost control resulted in increased operating margins. Since Steel Partners’ representatives took control, JPS’ cost control efforts have been successful. Operating expenses for the first nine months of fiscal 2014 were down slightly even as sales rose. JPS’ trailing results are difficult to compute due to the Stevens Urethane sale. 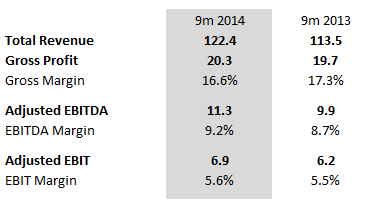 However, the company appears reasonably priced based on annualized 9 months figures. At this point, some discussion of JPS’ pension liability is warranted. Though much smaller than at any time in recent years, the size of the liability is still a potential source of trouble for the company. At the end of fiscal 2013, the pension assets were allocated aggressively, with 71% invested in equities. Interestingly, 28% of pension assets are invested in company stock, valued at $11.70 per share by an outside consultant. This “self-investment” introduces an element of pro-cyclicality. Should JPS’ operations perform well and the stock’s value increase, the pension deficit will decrease, perhaps spurring additional stock gains. This would reduce the pension deficit further, creating a virtuous cycle. On the other hand, if operations go south, the pension deficit could widen as JPS stock value decreases. This would require additional pension contributions, a textbook vicious cycle. Though JPS’ pension plan is aggressively allocated and holds a substantial investment in its own stock, management’s stated intent is to continue to reduce the deficit through cash contributions. This is somewhat comforting to me as a potential investor, but for now the company’s exposure to pension risk remains high. Though pension liabilities don’t carry the refinancing risk that term debt does, they carry real cash requirements that must be incorporated in any estimate of a company’s value. JPS appears to have momentum behind its operational improvements, and I believe its valuation will compress quickly once cost savings kick in fully and the pension deficit is reduced. Perhaps most importantly, I believe JPS Industries will benefit from Steel Partners’ control. Former management was engaged in debt-fueled empire-building, but the new management team appears focused on operational efficiency and cleaning up JPS’ balance sheet. Steel Partners may look to make an exit at some point via a sale of the company to a competitor, and an efficient company with an adequately funded pension is much more easily marketed. JPS also possesses substantial net operating losses, though these are limited by an ownership change that took place years before. Still, the company is able to shield some earnings from taxation, which should raise its valuation modestly. Alluvial Capital Management, LLC does not hold shares of JPS Industries for client accounts. Has Steel Partners been a bit sharp-elbowed with minority shareholders in the past? Yes, they have. If it’s any comfort, Steel Partners does not own a majority of shares outstanding, and any transaction would have to be approved by a majority of non-Steel Partners held shares. There is a large investment in the company’s stock by the pension fund, and for those purposes, the stock is valued at $11.70/sh by an outside consultant. But you show the current price at $7.13, and a quick look at Yahoo! Finance shows that the price over the last year has mostly been <$7.00. Is this pension fund investment in shares of JPST, or some other entity? If the former, what's up with the apparent pricing discrepancy? The pension fund is in shares of JPST. The discrepancy between the market price and the consultant’s valuation probably arises from the fact that JPS shares are unlisted and highly illiquid, causing them to trade at a large discount. The consultant may have used a methodology like private market value or a multiples-based approach compared to larger competitors, which might not take the illiquidity into account.